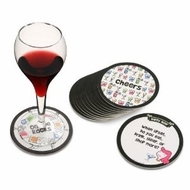 No happy hour or cocktail party is complete without these double sided ice-breaker coasters. Toast to a cheerful night of great company and awesome repartee with Conversation Starter questions intended for adults ages 21+. 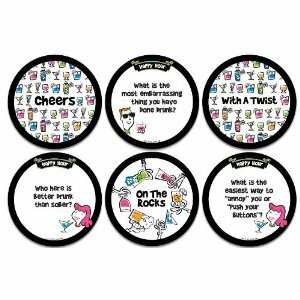 Set of 12 coasters, each 4" diameter, made of 2-ply absorbent paper and printed with classic Box Girls questions. The Box Girls started in 2002 when BFF moms Cece Feiler and Heidi Hadda were at a restaurant with their hungry husbands and six kids and the service was slow. To avoid a mealtime meltdown, the two moms started asking questions to engage their kids and what was potentially a disastrous night turned into a magical night of bonding and sharing. That night the first game in the successful Box of Questions original series was launched. Hundreds of thousands of boxes in this successful series have been enjoyed by families and friends across the globe. These clever, age-appropriate, party, and holiday themed question-games instantly unite any group while re-establishing the art of storytelling. Since the first game was sold, The Box Girls has donated a percentage of their profits to charitable organizations. Join us and enjoy. Toast to a cheerful night of great company and awesome repartee with fun questions like: When upset do you eat, drink, sleep or shop more?